Gradshop is proud of the high caliber of the students completing their Master’s Degree. We recognize the tremendous amount of energy, time, and effort that you put in to the completion of this degree. Most of you have completed your degree while trying to balance the demands of work, study and personal life. Nonetheless, we are impressed and would like to see your Master’s Degree Academic Regalia adorned with our distinguished Master’s Degree Hood! Wearing an Academic Hood indicates your scholarly achievement. 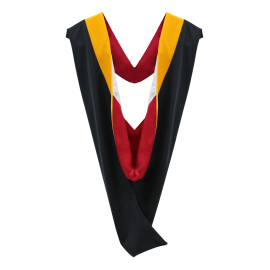 We specialize in producing excellent quality Academic Regalia at exceptional pricing and using high quality fabrics and expert craftsmanship. Our Academic Hoods are custom tailored to your academic requirements at a reasonable time frame. Take advantage of great savings and view our options for ordering the Master's Degree Gowns individually or select to order our Master's Degree Cap and Gown packages at great low prices. Check out your possibilities and place your order today for huge savings.